Believe it or not, when I started teaching art history I had to rely on physical color slides to illustrate my presentations. Ugh. When I stop to pause and think about how technology has revolutionized communications and learning, the transformative nature of digital images makes me speechless. Still, it takes more than access to an endless flow of digital content and knowledge of how to effectively use this content to make something meaningful. And that is why I am writing this post. Last night, I received these two Tweets from Michael Berman (who happens to be my boss) in response to my presentation, The Fractal Life: Harnessing the Power of the Social Era for Agile, Authentic Living. Michael's nudge made me think about how I've improved my design sense over the years to put together beautiful presentations but it also made me think about the importance of stressing why this is so important. Humans are visual creatures. Creating and engaging with visual content was more innate to our species than text. But beyond the "what came first" argument, we must understand the power of images to engage the affective domain of learning. For a moment, reflect on your childhood memories. What comes to mind? How much of what you remember is imprinted in memory because someone took photographs of those moments? Just last week, I spent a week in Carmel with my family and visited the gorgeous Point Lobos State Park. My older sister mentioned, "Wow, I remember coming here with mom and dad as kids!' I thought about that and could not remember the trip at all but had a clear vision of a single photograph of me and my two sisters sitting on one of the creamy colored rocks. I remembered the Pepsi-Cola jacket I was wearing, the "Captain and Tenille" style haircut I had, and I also remembered my younger sister clinging to her favorite stuffed animal (in tears because she had been told to leave it in the car initially). Our personal memories, our lives are shaped through images. And as they have become more accessible to educators, understanding how to use them effectively to persuade, impact, empower, and inspire others is an important part of communicating. But Michael's Tweets also made me realize that creating beautiful presentations requires more than nice images and thoughtful design. Here are just a few tips I would offer to anyone who has a desire to create more beautiful presentations. 1. Make the text-to-image paradigm shift. This can be a big, very big shift for college educators. If you are presenting live to a room of people, your voice, your facial expressions, and your the motions of your body should deliver your textual narrative. The screen behind you should be an opportunity to enhance what you say. Build your slides around images, not text. Text will play a role but it is more of an opportunity to anchor thoughts, reference sources, showcase key concepts. 2. View your role as a storyteller. What is your story about? What key message(s) do you want your audience to walk away with? And what image(s) come to mind when you imagine these messages? Be vulnerable and share stories from your own life. Make yourself and your topic real, relevant, and meaningful to your audience. I often use images of my family and videos of them or that they have created. I delete these slides before I share my slide decks on Slideshare or other social media sites publicly, out of respect for their privacy. Create a compelling title and a great title slide with an visually dynamic image. 4. Be thoughtful about text placement and font choice. Using Haiku Deck to design your presentations is a good way to train yourself to create visually-centric presentations with beautiful text. You'll see how the style of Haiku Deck demonstrates how laying white text over a block of transparent black will make it 'pop' off the page and anchor it visually on your slide. The transparency of the block also allows for the image behind the text to show through. Also, you will begin to start thinking about text placement as you select your images (a sign that your skills are developing!). Haiku Deck is simple to use, free, and is available in a web and iPad app. Another great feature is the direct integration with Flickr's collection of Creative Commons licensed images. When you select an image using Haiku Deck, it is automatically attributed (in very small text) at the bottom of the screen. Haiku Deck presentations may be presented from the web, embedded on other sides with html code, you may export them into PowerPoint files for offline presenting, export them into SlideShare, or you can export them into a PDF that will organize each image with your notes (a nice way to create a handout). After I used Haiku Deck for a few months, I found that the style of my "decks" had grown on me so much that I now organically design my own slides in Keynote to look like Haiku Deck slides (and, yes, I still use it too for special projects). Here is an example of a Haiku Deck presentation I made. Another incredible tool I use heavily and learn a lot from is Canva. It is an online graphic design tool. Even if you don't think of yourself as a graphic designer, I encourage you sign up for a Canva account if you are interested in creating more visually aesthetic content. You will receive emails (not frequently) notifying you of new, awesome, interactive tutorials that will teach you how to improve your design skills. Being a Canva user is like being enrolled in a Design Academy! 5. Use Creative Commons-licensed images and learn to attribute them correctly. Be a rockstar and model how to properly re-use digital images for your peers and students. If you are using images in a presentation, on a blog, or in some other manner that you did not take, you are using images that are shared under some type of copyright license. Traditional copyright (all rights reserved) requires the permission of the copyright owner for re-use, unless your re-use falls under Fair Use of the U.S. Copyright Law (see this fabulous video for help with this complex topic). 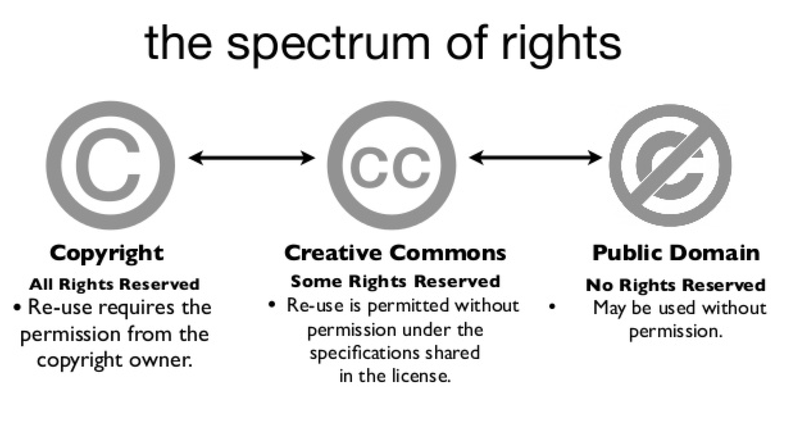 Creative Commons licenses offer more flexibility for re-use. Images that were never covered by copyright or that have have a license that has expired fall into the Public Domain and may be freely re-used. If you locate an image on Google Image search, for example, you likely have no clue who the copyright owner is and if you choose to download it and use it in your presentation, you may be violating copyright law. Try searching for Creative Commons licensed images on sites that provide you with the full attribution information. Some recommendations are Flickr, Compfight, and Wylio (requires an account and a premium account will auto-attribute images for you!). Want to understand how to attribute CC-Licensed images? Check out this great article from Creative Commons, "Best Practices for Attribution." Don't hesitate to search for Public Domain images too! Check out this presentation by kapost for some search recommendations. 6. Make it a labor of love. Creating beautiful presentations is intensely time consuming. I put dozens of hours into the creation of each presentation. When I look at my slides, I need to be able to feel my ideas through the slides. If I cannot feel what I'm trying to convey, then I know the presentation is not working. I know I am done with my presentation when I love it. The human brain becomes likely to drift off about 10 minutes. So, as you design your presentation, build in "moments" that will shift your audience into different experiences. This may simply be including a silent video that plays behind you instead of a still image, pausing to play a 1-minute video, having your audience respond to a poll, shifting over to Twitter to acknowledge Tweets coming in on the backchannel, or posing an open-ended question to the group. If you don't have one already, create a Slideshare account and share your presentations. When you upload a presentation, you'll have the option to share it with traditional copyright or select from one of the Creative Commons licenses. It will default to allow users to download your presentation but you have the option to disable this by editing the settings. Once your presentation is shared on Slideshare, you can embed it on a blog, Tweet it, and even directly share it to your LinkedIn profile! Make it social and inspire all your networks with your beautiful work!